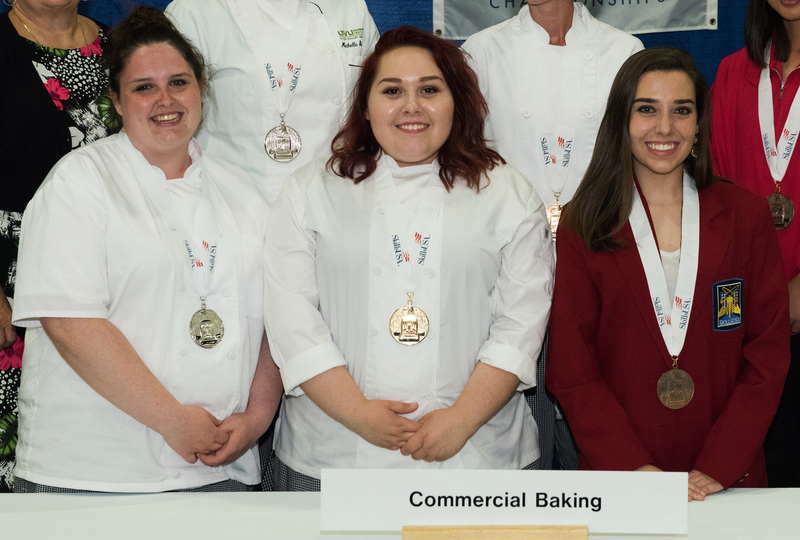 Hyde Park, NY – Recent high school graduates who are continuing their education at The Culinary Institute of America won both the Culinary Arts and Commercial Baking categories at the 2016 SkillsUSA national championship in Louisville, KY in late June. In fact, future CIA students swept the top three spots in the baking competition. First place winners Giovanni Bartolacci of Columbia, MO (Culinary Arts) and Jordyn Baker of Anchorage, AK (Commercial Baking) each earned full-tuition scholarships. Bartolacci began his CIA studies at the New York campus on July 12 and Baker will enroll at the California campus in September. Once she earns her associate degree there, Baker plans to transfer to the New York campus to complete her bachelor’s degree in Food Business Management. Placing just behind the appropriately named Baker in the baking competition were Courtney Morehouse of Concord, VT and Alexandra Berrich of Gambrills, MD, who earned scholarships of $4,000 and $3,500, respectively. Also earning a full-tuition CIA scholarship was Annie Yamamoto, last year’s winner in post-secondary Commercial Baking who placed third this year. The Reno, NV resident will join Baker in beginning her CIA studies this September in California. In the Restaurant Service category, Nikkol Mulligan of Webster Pit, ME placed in the top three for two straight years. Mulligan earned a $4,000 scholarship and will begin at the CIA in November. SkillsUSA national competitions cover 100 career and technical fields. In Culinary Arts, competitors prepare both hot and cold food through the production of a four-course menu. Commercial Baking requires students to master a written exam as well as hands-on cake decorating and the production of breads, rolls, Danish, cookies, and pies. Restaurant Service focuses on both technical service skills and guest relations, involving table setup, greeting, reservations procedures, describing food and drink items, taking orders, and serving and clearing multiple courses.